So I’m really excited to write about this item off the list, not just because I love carbs, but because this is on the of recipes that truly surprised me. Most of the recipes I looked at were really similar, like this one and this one. The ingredients are really really simple: potatoes, onion, salt, pepper, flour, and egg. Which is surprising, considering how much we enjoyed them. I had eaten potato pancakes before, but they weren’t memorable, so I was looking forward to a second round to see if there was something I missed. The potato pancakes I had experienced were basically glorified hash browns…and I’m not a huge fan of hash browns. 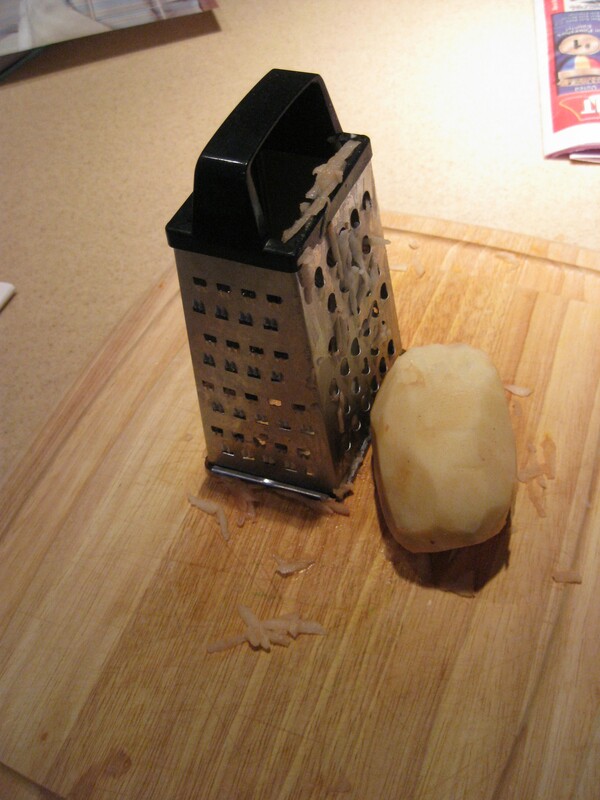 Start by grating the cleaned potatoes and then grating an onion. The potatoes and onion get mixed with an egg, salt, pepper, and some flour. That’s it. Slowly pour spoonfuls of the batter into a skillet with heated oil in the bottom. A friend with slightly more latke experience cautioned me not to make them too thick or cook over too high of heat, or they stay gooey in the middle. To avoid this unpleasantness, I tried to sort of pat down the center portion of the dough after pouring it in the pan so its not too thick. I pulled the latkes out of the pan and let them cool on a couple paper towels. Then, right onto our waiting plates. Like pancakes and omelets, these are a food enjoyed while one person stands at the stove and the others eat. But I did manage to pop back and forth between plate and stove. I’m sure none of you are concerned that I got enough to eat. Fresh off the griddle! Come and get 'em! The latkes were fantastic. Really fantastic. For something so simple they were surprisingly tasty and addictive. The onion adds a little sharpness and the flour makes them light adds crispness. Hot, crunchy, with just enough salt….all the qualities of a really, really good french fry. I think part of my enjoyment may stem from the fact that I was expecting hash browns and was surprised with something more complex and less greasy. Simple and delicious dinner. Hot dish! We ate ours with a dollop of sour cream and some fresh ground pepper. 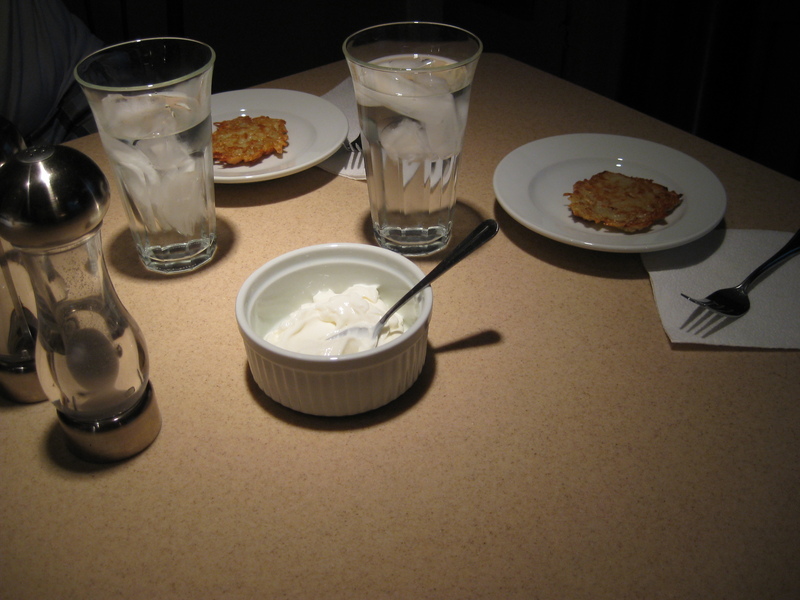 I think we ended up eating about 5 or 6 latkes apiece…I told you they were good! Handsome husband liked them with apple sauce on top and, being the carnivore he is, was wishing for a pork chop to go with it. Maybe next time…..
p.s. 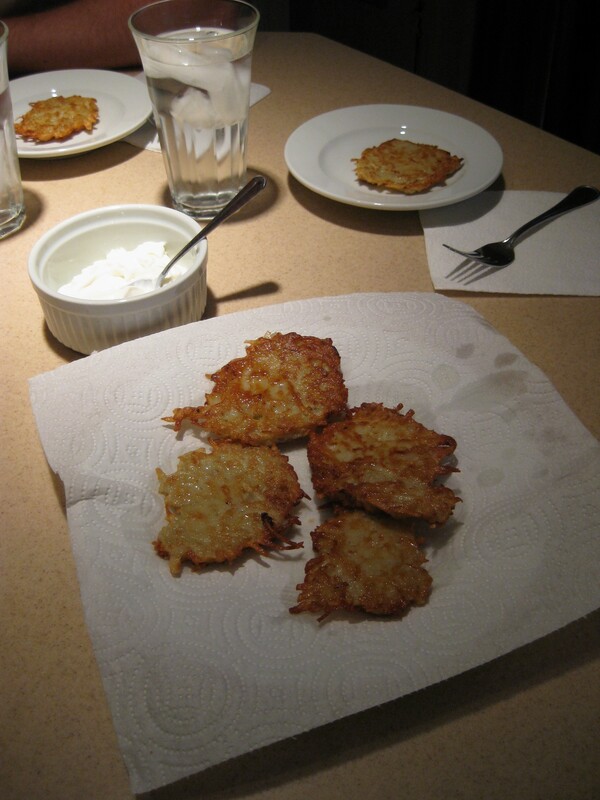 A special thank you to our foodie friend Jenn for recommended putting latkes on the list. I owe you dinner next time you’re in town! This entry was posted in 30 Before 30 and tagged cooking, latkes, potatoes, turning 30. Bookmark the permalink.